Montreal Jazz Festival: Rebecca and Larry Concert Review on Radio France. “The pleasure of creative festivals: find what is expected where not expected, and vice versa. 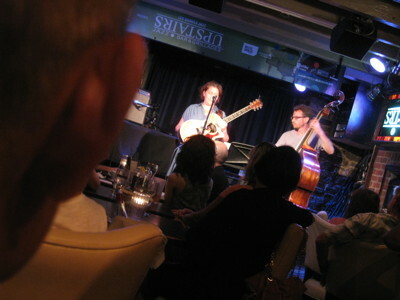 For example on Tuesday evening July 3, after an exuberant James Carter and his organ quartet at Club Soda, I was spinning away from the Place des Arts to get to the Upstairs, to one of the warmest jazz clubs on the planet. The day before, the organist Dr. Lonnie Smith Jr. had set fire to the venue. Today, luxury and pleasure. They are husband and wife. The singer and guitarist Rebecca Martin, accompanied by Larry Grenadier on bass. An album on Sunnyside presented the trio with sax Bill McHenry. This time, the original songs and standards (which she prefers to call ‘elders’) are presented “naked”. With her eyes half closed, a resonant voice and intimacy and confidence: Rebecca helps us to understand the backbone of the songs by giving then expressive dimension. Larry Grenadier, extends the guitar and hugs and rushes the voice of his companion. Total humility and elegance. However, this apparent simplicity is just a tremendous science. Inspiration without asperities, improvisation on a fragile thread of no return. http://rebeccamartin.com/wp-content/uploads/2015/06/rm04.png 0 0 rebeccamartin http://rebeccamartin.com/wp-content/uploads/2015/06/rm04.png rebeccamartin2012-07-05 11:58:182013-02-09 21:17:03Montreal Jazz Festival: Rebecca and Larry Concert Review on Radio France.